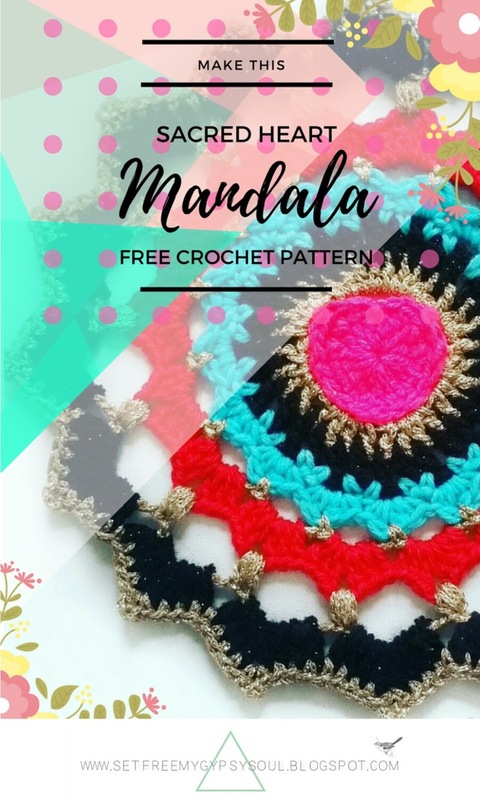 Make this beautiful Sacred Heart design crochet mandala using a series of treble crochet, double crochet and puff stitches with this week's free crochet pattern for Mandala Monday. 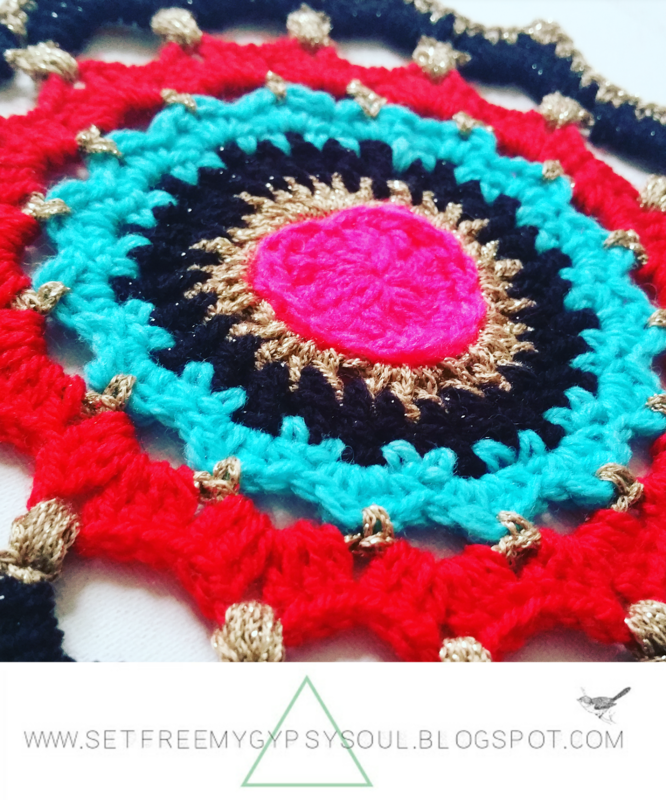 This week's Monday Mandala is a very special one, in honour of my darling, beautiful boy Buzz. My constant companion for 16 years and true soul-mate. 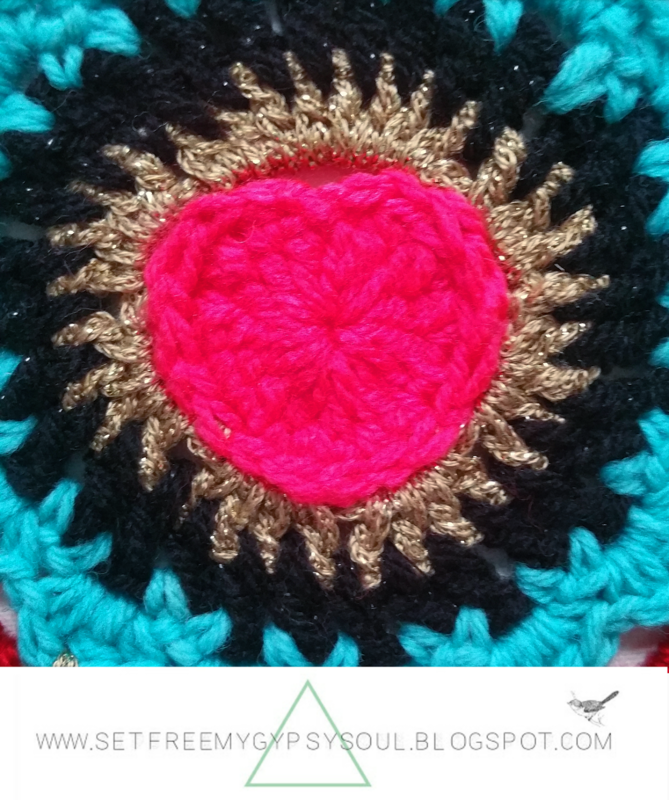 This crocheted mandala uses a combination of simple stitches to create a sacred heart design centre piece for the mandala and some back post crochet to make it pop. 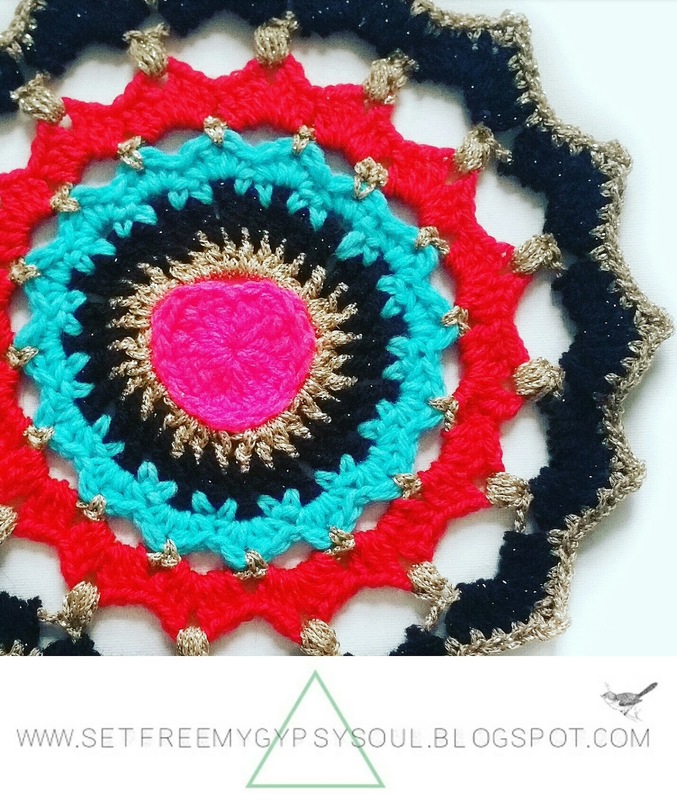 Using the gold yarn against the traditional reds and blue really gives the mandala some dimension. This gorgeous gold yarn is from +bmstores at £1.99 for a ball of 100g. Round 1: Start with a magic loop and ch 3 as first tc (US dc). 14 tc (US dc) into the loop. Join with slip stitch. Round 3: Join new colour yarn through back post of the 2nd of the 2 tc's (US dc) on the right hand side. Ch 3. Skip 2 stitches and make a back post only dc (US BPsc). Ch 6. Skip 6 stitches and make another BPdc (US BPsc). Ch 3. Skip 2 stitches and BPdc (US BPsc) through the dc (US sc) of round 2. Ch 3, skip 2 stitches and BPdc (US BPsc) twice. Ch 3. Round 4: Ch 3 as 1st tc (US dc). 3 tc (US dc) into the loop. 8 tc (US dc) into the next loop. 4 tc (US dc) into each loop space around the work. Round 5: Join new yarn in any space and ch 4 as 1st tc (US dc) plus a ch 1. Tc (US dc) and ch 1 in each space. Join with slip stitch and fasten off. 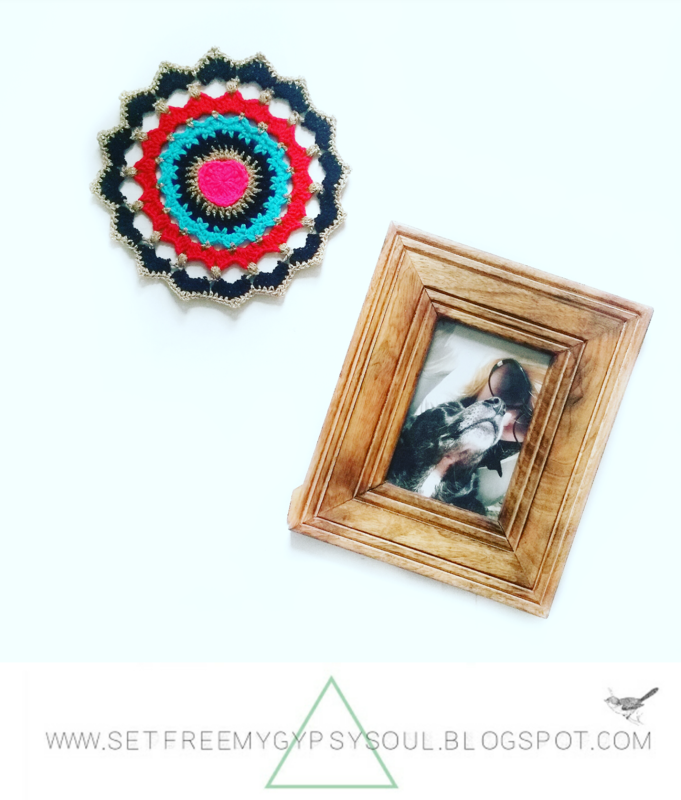 Round 6: Join new yarn in any space. Ch 3 as a dc (US sc) plus a ch 2. **Dc (US sc) into the next space. Repeat ** to form ch 2 loops around the work. Join with slip stitch. Round 7: Ch 1 as 1st dc (US sc). 2 tc (US dc) and a dc (US sc) into the loop. dc, 2 tc, dc (US sc, 2dc, sc) into each loop around the work. Join with slip stitch and fasten off. Round 8: Join new yarn between any 2 tc (US dc) from Round 7. Ch 6 as 1st dc (US sc) plus a ch 5. Dc (US sc) into next space between R7 tc (US dc) stitches. Ch 5. Round 9: Join new yarn into any loop and ch 3 as 1st tc (US dc). 2 tc, ch 2, 3 tc into the same space (US 2 dc, ch2, 3dc). 3 tc, ch 2, 3 tc (US 3 dc, ch 2, 3 dc) into each space. Join with slip stitch and fasten off. Round 10: Join new yarn in any ch 2 space. Ch 1 and make a 4 y/o puff stitch into the same space. Ch 6. Make a 4 y/o puff stitch into every ch 2 space and ch 6 around the work. Join with slip stitch and fasten off. Round 11: Join new yarn into any loop space and ch 3 as 1st tc (US dc). Make 7 more tc (US dc) into the loop. 8 tc (US dc) into each loop. Join with slip stitch and fasten off. Round 12: Join new yarn between any 4th and 5th tc (US dc) of your Round 11 shells. Ch 4 as 1st dc plus a ch 3. Dc (US sc) into the same space. Dc (sc into the next 7 spaces. Repeat dc (US sc), ch 3 and dc (US sc) into the same space - again this is between your 4th and 5th tc's (US dc) of the previous round. Repeat around the work. 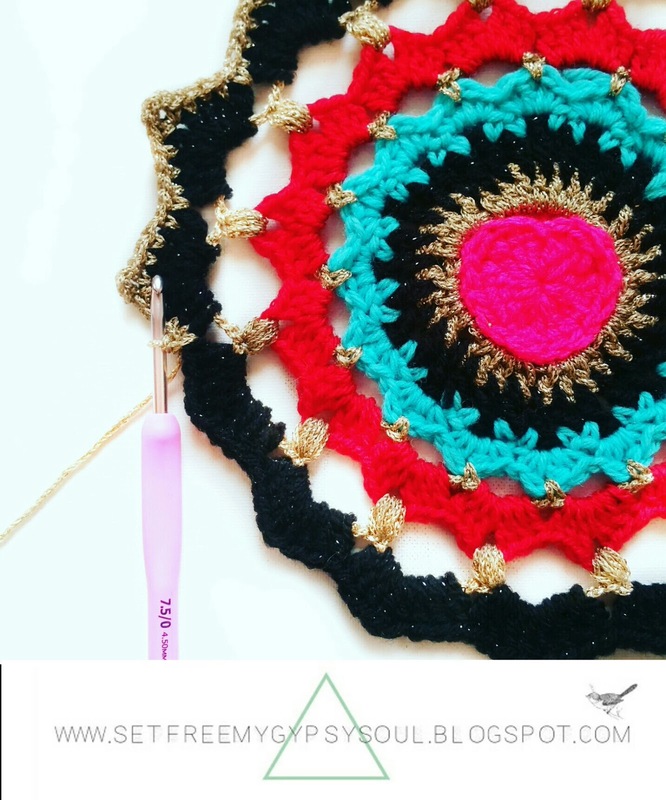 Join with slip stitch and fasten off, weaving in ends. 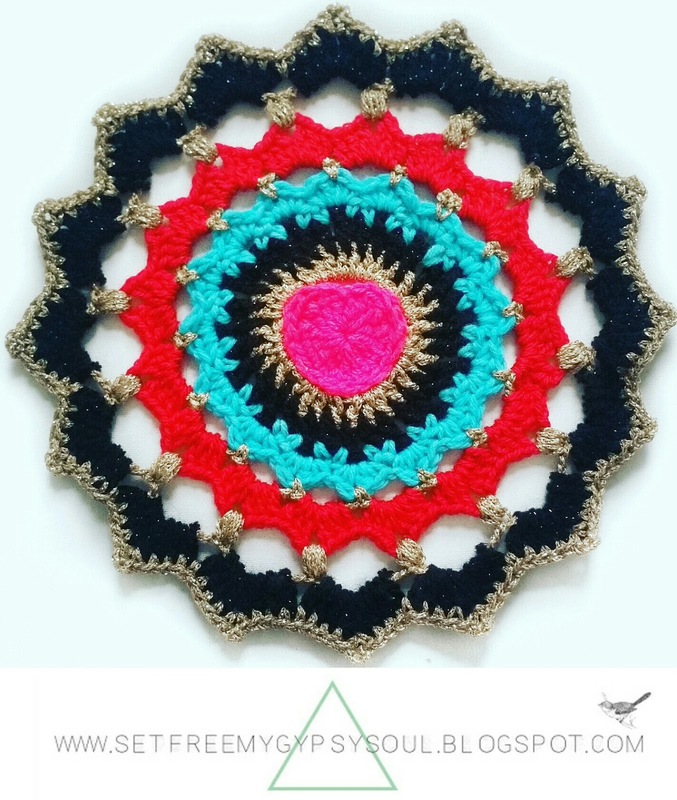 And don't forget to show me your version of the Scared Heart Love Buzz crochet mandala on Instagram by tagging me @setfreemygypsys0ul or using the hashtags #SFMGS or #lovebuzzmandala.